If you own an iPhone running iOS9 and are a Rogers customer you can turn on wifi calling to make it easier to make phone calls in poor cell areas . When you enable Wi-Fi calling and are in an area with poor cell coverage (like our school) your phone will use the wifi network to send and receive your phone call instead of the cell network. Where ever the cell network is good, that will be the first choice, wifi is only used where cell coverage is poor. Your phone calls will still be charged under your plan as if they were sent from a cell network so the same restrictions apply as for regular cell calls under your plan. You are all ready to make calls where ever there is good wireless! Click on each number to navigate to the next step. You can email from a variety of Apps on your mobile device. If you have multiple email accounts accessed by your device you can choose which account to send from. To do this, just tap the From: email address and a scroll of your email accounts will appear. Tap the email account that you would like to send from! If you've just fired up your new iPhone 5S, or have updated your iPhone 5, iPhone 4, iPhone 4S, iPad 2, iPad 3, iPad 4 or iPad mini to iOS 7, you'll quickly find the differences between iOS 7 and iOS 6 are humongous. We've compiled a list of dozens of tips for you to get the most out of the new features Apple has added to iOS 6. In some instances, the changes can be tricky to find, but once you find them, your workflow can quickly change for the better. Some are new, some you might know already, but we can promise this: all will help you get more out of your phone. UPDATE: We've added even more tips on top of the loads we've already added. Notification CentrePerhaps one of the most used features of an iOS device after core apps, the Notification Center has seen several tweaks in iOS 7. In iOS 6, you are required to do some funky swipes to get rid of notifications. Now with iOS 7, you can quickly swipe up on a notification to remove it from your screen. In iOS 6, the Notification Center is just one long stream of notifications. In the iOS 7 update, the notifications are broken up into today, all and missed. Today pulls information from your calendar to give you a daily briefing on the day's activities, and Missed gives you access to missed calls. It's still accessible by swiping your finger down on the top of the screen. If you don't want people to access it from the lock screen when you're not with the phone you can do this by going into Settings > Notification Centre. Here you can select whether you want to see both the Today View and the Notifications View without your passcode. In the Today View you can also set what you see including Today Summary, Next Duration, Calendar Day View, Reminders, Stocks and Tomorrow Summary. All can be turned off or on from the Notifications Centre setting panel. Furthermore Notifications can be set by time or manually. Managing which apps give you notifications and which don't can also be controlled from here and works in the same way as iOS 6. With each app having separate controls over the way its notifications are displayed. Control CentreSwipe up from the bottom of the screen from anywhere in iOS and you get the phone's quick settings panel. There are five buttons that allow you to put your device in airplane mode, disable Wi-Fi, disable Bluetooth, turn on/off Do Not Disturb and adjust portrait lock. Brightness settings can be toggled with a slider, followed by the ability to control your music by skipping songs, pressing play/pause and adjusting the volume. AirDrop and AirPlay are found underneath. Apple has also added a torch (flashlight) and next to that is the quick button to the alarm clock, calendar and camera buttons. If you've got a pesky app that isn't working too well because the Control Centre keeps coming up instead you can disable it in apps and on the lock screen. Go to Settings > Control Centre > and select what you want from there. If you don't plan on using the new AirDrop feature in iOS 7 then turn it off. It will save you battery life looking for interested parties (other iPhones) all the time. To turn it off, pull up the Control Centre and double tap on AirDrop logo. Here turn it off. Make the text bigger in apps Always forgetting your glasses? Apple now lets you change the text size in apps that support the feature - all Apple apps do - so you can see what you are doing, or make things smaller of course. To change the the text size of all apps that support Dynamic Type go to Settings > General > Text Size and slide the bar to where you want it to be. New sounds and ringtonesGo to Settings > Sounds and then start playing some tunes. It's here you can also set the phone to not make a noise when you lock the phone or type on the keyboard. CameraThe photo app in iOS 7 saw a huge revamp. Most accessible by swiping up from the right-bottom corner of the lock screen or via the quick settings panel, the Camera app is now broken up into swipe-able video, photo, square and pano sections. To access the different modes swipe left or right. For even more Camera tips and tricks check out our iOS 7 camera tips and tricks: Getting the most out of the iPhone camera feature or our iOS 7 photo and iPhoto tips and tricks: Getting the most out of your iPhone pictures. Also new are photo filters. Available filters include Tonal, Noir, Fade, Chrome, Transfer and more. They're accessible by the funky three-dot logo in the bottom of the screen. You choose a filter and snap the pictures you want. You can now focus photos on iOS 7 without tapping the screen with your finger, coming in handy if you have a glove on or have something against screens. You can focus the photo by holding down the volume button for a few seconds - similar to shutter buttons on DSLRs and point-and-shoots. Go into the camera app, swipe to far right to the Pano option. Tap on the arrow to change direction of the panorama you want to capture - left to right or right to left. You'll have to hold the phone in portrait for it to work. Hold the phone in landscape mode to do a "vertical" panorama up to the stars. Check out our iPhone Panorama tips and tricks feature with the iPhone 5 to find out more on how to take the best panoramas in town. Users can snap photos in Burst mode by either holding their finger on the shutter or on the volume key to take a burst of photos as the action happens. Once you've taken a Burst of photos you can then choose your favourite one, although iOS 7 will try to do this for you. To select the one you want, press Favourites, and then select the one you want to use. The one Apple has chosen is represented by a grey circle underneath. To delete a photo Burst go to Photos select the photo Burst (it will look like it has two further images stacked behind it) and press on the delete key. It will ask you whether you want to delete all photos from this Burst, click on the red words "Delete Photos". PhotosThe Photos app is now sorted by years, collections, and moments. These are smart groupings of your photos and videos based on time and place. iCloud Photo Sharing has also been added so that you can create a shared photo stream with a select group of people. They can post photos, videos and comments to your stream, and it all appears on everyone’s iOS devices in their Photos app. iCloud Photo Sharing is accessible in a tab via the Photos app. You can now share a complete moment with people by clicking on the Share button above a collection of photos you've take. Pressing the word Share takes you through to the option to "Share this moment" or "Share some photos". Pressing the one you want lets you share it via Message, Mail, iCloud, Facebook, and Flickr, or copy the images, or print them. Users will also be able to AirDrop them to another iOS 7 device. To quickly scan the hundreds of images you've taken over a year simply press and hold your finger on the screen and run it over the images you've got. Like scanning through a YouTube video, moving your finger will reveal a quick thumbnail of the pictures you've taken. Universal searchNo longer do you swipe to the left to search content on iOS. Within iOS 7, you can find phone numbers, apps, texts emails and more by manually swiping down anywhere on the home screen. A search "Spotlight" box will appear, allowing you to type away to your heart's content. To restrict what it searches for go to Settings > General > Spotlight Search and tick the relevant boxes. WallpapersOne of the neatest aspects of iOS 7 is parallax wallpapers. Using the gyroscope on your iPhone, iOS 7 makes the wallpaper move with your movements. Tilt to the right, so will your wallpaper. It's as if you can see the wallpaper under the apps. Wallpapers are still set-up like on iOS 6: Settings -> Wallpapers and Brightness -> Choose wallpaper. You can now set panoramic photos as your lock screen, as well. When going to set the wallpaper in settings, you can move and scale through the image to pick your favourite part of the capture. You can now choose Dynamic or Stills and your own Photos. Closing apps and switching appsSwitching through apps is still done by double tapping the home button, but you'll notice the interface now appears more like Web OS. You can swipe left and right to navigate apps. Flick up on an app closes it and you can close an app while you are in it. Something you couldn't do in iOS 6. Personal HotspotSetting up your phone as a personal hotspot is the same as in iOS 6. Go Settings > Personal Hotspot and go from there. You can either opt for the password Apple has generated for your phone or chose your own if you want to give it out easily. Do Not DisturbIf you travel a lot to different time zones it's probably a good idea to schedule your iPhone to go into to Do Not Disturb mode. Go to Settings > Do Not Disturb and then schedule in a time. We've set ours from midnight to 6am. During that time all calls and alerts will be silenced. If you are worried that you might miss an important call you can set the phone to allow calls from Favourites or repeated calls if someone is calling more than once in a three-minute window. You can now in iOS 7 set it so the Do Not Disturb works only when you've got the phone locked or all the time regardless of what you are doing. Handy if you are in the middle of a presentation. To get rid of the battery per cent symbol on the top bar on your phone go to Settings > General > Usage and then disable Battery Percentage. If you are trying to save battery life visit this pane in Settings. It determines what apps can refresh their content when on Wi-Fi or a mobile network, or use Location Services. Go to Settings > General > Background App Refresh and select whether you want apps to work in the background or not. You can turn it off completely or limit it by app. Apple spent months adding new features and you just want to turn them off to save power so you can play Candy Crush on the last train home. That lovely Parallax effect whereby you move your phone and the wallpaper shifts slightly to give you a 3D effect, well it might drain your battery and you can turn it off. Go to Settings > General > Accessibility > Reduce Motion. Spirit levelFor your inner home improvement, a nifty spirit level has been added to the Compass app (find it by searching). To access it, open the compass app and swipe to the right. You then physically lay your iPhoneon a surface you're trying to level, and it will tell you just how far off you are. Manage iCloud back-upGo to Settings > iCloud > Storage and Backup > Manage storage. If you've a new iPhone and aren't fussed about the back-up on the old one you can delete it from here and save yourself some space for all the new files you are saving on your new phone. "In a meeting, what can i do for you?" isn't that friendly. Maybe you are more of a "Yo dawg, what's happen?" kind of dude. If you are, go to Settings > Phone > Respond with Text and start making up your replies. Still launched by holding the home button, if Siri is unable to pronounce your name, it will ask you to "teach me how to say it". Using your voice, you will pronounce your name, and Siri will come back with new options on how it thinks your name should be pronounced. You play the options and select one Siri should stick with. Siri can now search Twitter. Simply ask, "What is Pocketlint saying on Twitter" and it will bring up the latest posts. You can now change the voice gender of Siri to be male or female if you opt for English United States. It can be achieved by accessing Settings -> General -> Siri -> Voice Gender. In the UK you can't get a female voice if you opt for English (United Kingdom). Within iOS 7, apps are now automatically updated. No longer do you have to fire up the App Store within iOS 7 and manually press update for each app installed on your phone. The second an app update is pushed out by a developer, it will begin downloading. Of course, if automatic updating apps are something you don't want, it can be disabled in settings. Launch Settings, scroll down to the iTunes & App Stores button and uncheck the Automatic Downloads area. Also useful if you find yourself on a limited data plan, Apple has added monitoring for how much data a specific app is sucking in. This is a feature Android has had for sometime. Settings -> Mobile and scroll down to Use Mobile Data For, where you'll find a list of all your installed apps. Want to find the most popular apps near you? A "popular near me" recommendation engine has been added to the App Store, pulling transit apps and the like from locals around you. Go to Settings > General > Passcode & Fingerprint > type in your passcode > Fingerprints. Tick the iTunes& App Store box. The big one if you've got kids. Go to Settings > General > Restrictions and scroll down to In-App Purchases. Disable to stop anyone running up a huge bill on Candy Crush. Have that one pesky person that won't leave you alone? You can block unwanted phone numbers from calling you, sending text message or iMessages. Under the phone section of the Settings app, you scroll down to the Blocked section and click add new. In Messages for someone who recently sent you a slew of text messages, tap on contact and then info. Scroll down and tap Block this Caller. In the iMessage app when chatting with a group, images of the person are now displayed so you can keep straight whom you're communicating with. To navigate back to the main Messages hub to see all of your correspondence, you simply swipe your finger left to right. This negates any need to press a button on the screen and makes a relatively intuitive way to navigate. At the top of the message stream there is now the word "Contact" pressing this will let you quickly call or FaceTime the person. To find out what time you sent a message swipe from right to left in the message stream and a time will appear next to each message. Swipe from right to left in the Messages hub and you can quickly delete a conversation. If you are having trouble sending your iMessages (over data) you can opt to have iOS 7 revert to sending the message as a SMS instead. Go to Settings > Messages and tick the relevant box. To stop you receiving iMessages on all your iOS devices you can set which emails or phone numbers you get the messages to and therefore the device. To make sure it is only your phone and not your phone, your iPad and your computer, go to Settings > Messages > Send Receive and then select the addresses and numbers you want to get messages to. MailBeyond an overall UI refresh, there are several new tricks inside Mail. You can shake to undo, see enhanced search results, mark all messages as read and swipe right from off screen to go back. Finally you can now see how many unread emails you've got. Go to Mail > Mailboxes > Edit and select Unread. You can also do the same for a host of other folders to for the first time. Go Mail > Mailboxes > Edit and select which ones you want. Drag down in your inbox to reveal a search box. You can now search your entire inbox for a keyword rather than just To, From, Subject. You can also limit your search to All mailboxes or the current mailbox you are in. Furthermore you can also limit it to conversation threads. In your inbox swipe right to left on the email in question to reveal a big red delete box. All the above features are quick to access now at a swipe of your finger. On the email in question swipe right to left and click on more. Just drag down from the top of the page as if the inbox was on an elastic band. If you get a lot of emails and don't want to miss certain emails from certain people (your other half or the boss, for example) you can make them a VIP. To make someone a VIP, find an email from them, press on their name to see their Contacts card. Beneath their details press on the setting "Add to VIP". They are now a VIP. To Remove them go to the same place. 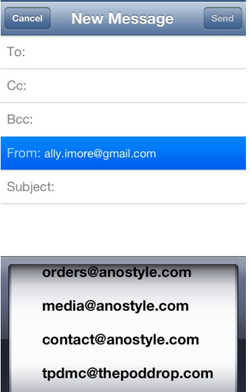 If you have more than one email account on your iPhone, iOS 6 will let you have different email signatures for different accounts. To set up your signatures, go to Settings > Mail, Contacts, Calendars, and scroll down to Signature. Tap on Signature and then Per Account. You can then add personalised signatures for the accounts you want. Yep you can change the Flag Style from flags to circles if that gets you excited. Settings > Mail, Contacts, Calendars > Flag Style. You can now mark all as read in Mail. Yay. In a mailbox, or the combined inbox, you just tap "Edit" at the upper right, then tap "Mark All" at the lower left. Then choose "Mark As Read" from the pop-up menu and all your messages should be marked as read. If you find yourself walking often - say, if you live in a large city such as New York or London - updates to Maps in iOS 7 should please you. You'll find turn-by-turn walking directions that should give you a faster route than driving directions. If rumours are to be believed, Apple has plans to use its new M7 processor in the iPhone 5S to switch from driving to walking directions when getting out of a car. If you know you'll be walking more than driving, Maps' settings can be toggled to default to either preferred directions. It's accessible under Settings > Maps > Preferred Directions (at the bottom). iOS 7 keeps a track on where you hang out most, allowing it to cache relevant nearby data. Once you’ve used iOS 7 for a while, go to Settings > Privacy > Location Services > System Services to view a list of where you've been most. If you are worried you can turn this feature off in the same place. SafariLike Messages, Safari has been updated to allow users to swipe left to right on the edge of the screen to go back - doing away with any button tapping. As you scroll down a webpage, the bottom Control Center will disappear and the URL omnibox will fade making for a more immersive, full screen, reading experience. Search is now completed via one box like Chrome. When you begin typing into the box, it displays the top URL you've frequented, suggestions from Google Search or other search engines, and your Bookmarks and history. As for tabs, you can now decide if you want to browse a web page in "Private" a bit easier - similar to Chrome's Incognito feature. The tab page has also been redesigned for a card-flipping interface that's quite handy. Shared links have been added to see what's happening on your Twitter timeline. Furthermore, you'll find Reading List, a seamless "one article to the next" set-up. Either press on the X or swipe right to left to move the tab off the screen. Turn on Private mode, say yes to closing all tabs, then turn it back off again straight away. It will save you a lot of swiping to delete tabs. For the security minded, Apple has included a Do Not Track option for mobile Safari, like the Mac version. It can be enabled Settings -> Safari -> Privacy & Security. It will prevent websites and advertisers to look at your daily browsing habits. To help you get to the search page quicker, Safari can preload the top hit for you before you've even pressed the link. If you don't like the sound of this because you are worried about data costs then you can turn this feature off. Go to Settings > Safari > Smart Search Field and toggle the button. When you visit a site that isn't optimised for mobile, or is covered in adverts you can now switch on reader mode to just get the text. To do this wait for the page to full load and then press the button on the top left hand corner that is made up of four lines, the fourth being shorter than the others. AirDropLike on the Mac, you can now transfer files from iPhone to iPhone. Swiping up from the bottom of your screen - where an option is found to make yourself discoverable to everyone or only people in your contacts - can enable it. To send a photo, video, contact or other document, find the share button and then select the person you want to share with. Files are transferred over Wi-Fi and Bluetooth. AirDrop doesn't work with all versions of the iPhone. If you've got a iPhone 4 or iPhone 4S it won't be available or even show up on your phone. Stoping targeted adverts in advertsAdditionally, you can now allow apps not to show you targets apps. The Limit Ad Tracking feature is found in Settings -> Privacy -> Advertising. If you are wondering where week view has gone in the calendar has gone, don't panic. Simply turn your phone to landscape and you'll get Monday to Friday on one screen. tap the search button in the Calendar app at the top of the screen to bring a list up of your appointments. Slow keyboard on iPhone 4S with iOS 7We've seen plenty of reports that the keyboard is very sluggish on the iPhone 4S once iOS 7 is installed. To combat this go to Settings > General > Reset all settings. While we can't vouch for it working, the word on the Internet from people that have experience the problem is that it fixes the bug. Change background colour in foldersIt's all about layers remember, so the background colour of your folders will be determined by the wallpaper you've got. If you've got a photo with lots of brown in it the folder colour will be brown. To change this go for a Wallpaper that's a bit more colourful. Deleting MusicIf you are trying to delete a track and it just won't disappear it might be that you've got the Show All Music toggle ticked. To turn off the ability to see all music that has been downloaded or that is stored in iCloud go to Settings > Music > and toggle the "Show All Music" button. You can then go back to the song in question and swipe to delete. Activation Lock Activation Lock, found within Find My iPhone, is a new feature iniOS 7 that makes it difficult for anyone else to use or sell youriPhone, iPad, or iPod touch if you ever lose it. Even if you erase your device remotely, Activation Lock can continue to deter anyone from reactivating your device without your permission. To turn it on go into Settings > iCloud and then make sure Find My Phone is turned on. To find out more about Activation Lock check out our Activation Lock in iOS 7: What it does and how it can make your iPhone more secure feature. Making Touch ID even more accurateTo make Touch ID even more accurate, scan the finger you use the most twice as two separate fingers. Apple does't care, but now you've doubled the error rate for your thumb or index finger when you lay your finger over the Touch ID sensor. This update includes some new features! Click on iOS9 below!